My cat is a voracious eater, so it is not possible to leave out a weekend's worth of food when I take a short trip away from home. He would eat all of the food in the first few hours, making himself sick! 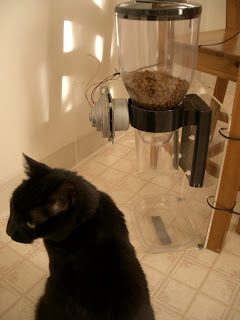 In order to dole out his food in small amounts, I built an automatic feeder out of "found" parts and minimal amounts of machining. 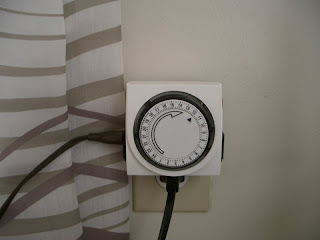 The system starts with a standard "vacation timer" for home lighting. 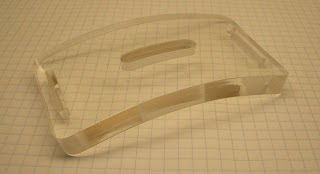 This particular model has a plastic tab for each 15-minute increment of the day. By flipping the tabs in/out from the center, any program can be constructed that has 15-minute resolution. The power cord from the "vacation timer" goes to a photographic enlarger timer. This device allows the AC power to flow through it for a pre-determined number of seconds. I left the "timer" switch in the on position, so the device begins timing as soon as the AC power from the vacation timer is received. This device was indeed homemade, but not by me. I found it at a flea market years ago. 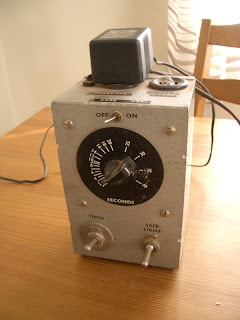 The power from the enlarger timer goes to a standard AC wall transformer, and then to a gear-motor on the feeder. The motor is rated for 24 VDC and originally came from an HP laserjet. I am running it on a 9VDC from the wall transformer, and I also used a ballast resistor to get the motor turning as slowly as possible. The motor is connected to a dry cereal dispenser (sold for humans!). The dispenser had a knob that could be turned to dispense a quantity of cereal, and I replaced that knob with the motor's shaft. The dispenser's hopper tapers down to a straight-walled cylinder and there is a flexible rubber butterfly valve (of sorts) that fills the cylinder's diameter. 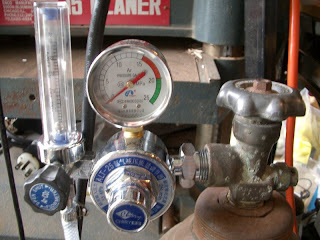 The valve has 6 blades, and as it turns, it meters out a specific volume of food. I have the enarlger timer setup to turn the valve 1/6 of a revolution so that the same amount of food is dispensed each time. I also added an output chute to keep the cat's paws away from the butteryfly valve. I also built a sturdy base out of acrylic and wire-tied the whole contraption to a table leg. This feeder is actually the second version that I have built. The first version was based on a meat grinder (using the auger to meter out food without any blades or grinding plate). It didn't work as well because it had a tendency to mash up the food, or get jammed, and generally not work smoothly and consistently. The new version with the cereal dispenser has worked extremely well. I've worked with acrylic in many different situations, but have never yet put a piece in the oven to thermoform it. I've used strip heaters and heat guns before, but these techniques are more suited to edge bends, and today, I had the task to curve a thick piece in a consistent arc. Here is the machined blank, ready to be formed. 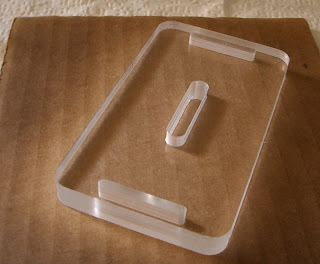 This is 3/8" thick cast acrylic (about 2" by 4") with a few slots cut into it. I put the acrylic on a piece of cardboard, since I was afraid the oven rack or metal pan would stick to the acrylic during heating. As it turned out, the hot acrylic had no tendency to stick to anything, and the cardboard got pretty toasted. The next time that I try this, I will use thin MDF or peg board to support the acrylic. I put the acrylic and cardboard into my toaster oven, which was preheated to 350*F. After 5 minutes, the piece was getting flexible, but not soft enough. After 7 minutes total, the piece was perfect, and I quickly placed it onto my mold. The mold is made of three 3/4" thick pieces of MDF, which I cut into an arc with bandsaw, then sanded and primed the edge. After the primer was dry, I used double-stick tape to attach a piece of 1/32" delrin. This provides a slick surface that can withstand heat and many chemicals. 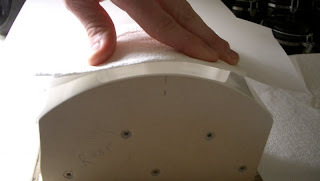 I used another piece of 1/32" delrin and a paper towel to push the softened acrylic down onto the mold. It took less than minute for it to hold its new shape. I deburred and flame-polished the edges to finished the piece. In order to strike the arc, I usually have to push the pedal pretty far down, sometimes all the way. Having a really clean, sharply-ground electrode, and a really clean metal surface will make striking an arc a lot easier. 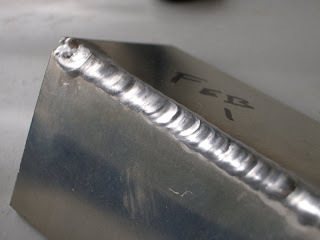 http://www.millerwelds.com/education/articles/article108.html This "arc force" control is also called "dig" and describes how forcibly the stick welding arc can push material away. A high arc force setting will boost the arc current when the machine senses the arc voltage is dropping too low (meaning a short-circuit is about to happen). This boosted current blasts away base metal and rod, preventing the stick from welding itself to the base metal. Anyway, I had no idea about this control for the first few sessions that I used the TIG welder, and left it all the way up (50A). I noticed that it made striking the arc much easier. 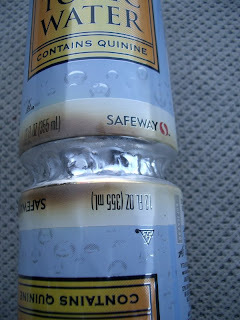 On thick materials, this was not a problem, but on thin stuff, I would blow through the material upon striking the arc. 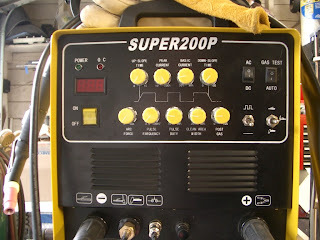 The arc force control is supposed to be enabled only for stick welding, but that is not the case on this machine (super200P). During TIG welding, I assume the voltage is low enough to cause the arc force control to set a "minimum" amperage of 50A, which is why it was a big problem for thin material. For TIG welding, be sure the arc force control is turned all the way down! AC balance: This machine has a strangely configured balance control. The range is %20 to %80 electrode positive. It's unusual to indicate the electrode positive percentage, and anything over %50 positive is considered not useful at all. I am sure there are crazy situations that require it, but the electrode melts so easily, and the base metal has such a huge etched area at those levels, I can't see it ever being that useful for common operations. So, never set the balance past %50 even though the machine's range makes it seem like it might be a useful thing to do. In fact, having a minimum of %20 electrode positive is still quite a lot. It would be nice if the machine went down to %5 or %10. Gas flow: The Chinese flow meter is calibrated in liters per minute, not cubic feet per hour. Watch those units! lpm is approximately half of cfh. Electrodes: No one uses pure tungsten anymore. The information on the web is old, and repeated by people who have never used modern electrodes or modern welders. 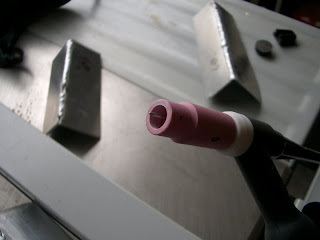 You can weld all common metals with a ceriated electrode ground to a fine tip. 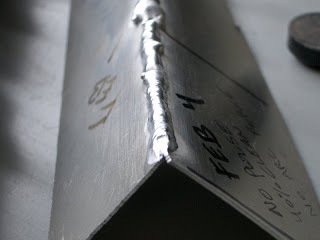 The tip will round-over a little bit during AC welding, but there is no point in "balling" the tip of the electrode. All it does, is make the arc difficult to control. Pulse feature: I have tried it a few times, but I haven't noticed any big difference in welding ease or speed. I'll try it later, and write more about it. Finger-tip control: After using the welder for a while with the pedal, I switched to the plasma cutter, and hooked up the finger-tip control switch. It didn't plasma cut. The machine would not strike an arc at all. After futzing for a long time, I hooked up the pedal control (even for plasma cutter), and it started to cut like a dream. I tried the same for the stick welder setting, and it too, required the pedal to be connected in order to weld. It seems the finger-tip control circuit in the welder either died, or never worked properly. Hmmm. I'll bet this has to do with the "background" "max" and "arc force" settings.